Joel Forke, production assistant, looks at the 1,000 liter still that produces vodka, whiskey, and other spirits at Infinity Beverages. Drop by drop, bottle by bottle, barrel by barrel, Matthew Rick has built Infinity Beverages Winery & Distillery, a thriving wine and spirits business, in Eau Claire.Not content to create just a handful of predictable reds and whites, Infinity Beverages has embodied its name by producing a seemingly endless array of wines and spirits aimed at pleasing palates of all kinds. 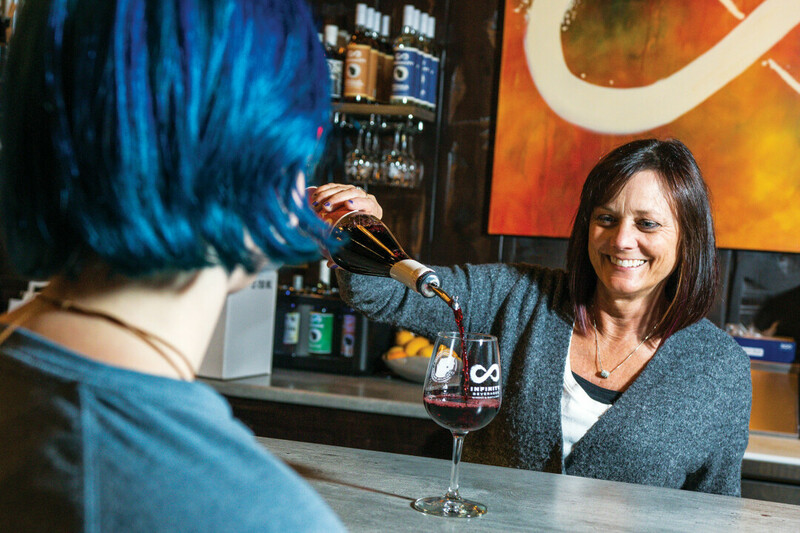 Whether at Infinity’s Tasting Lounge on Eau Claire’s south side or through scores of retail outlets across the region, customers can experience a sip of Infinity all over Northwest Wisconsin. Melissa Christianson, front of house manager, pours a complimentary taste for a visitor at the Tasting Lounge. Rick, 32, came up with the idea for Infinity – including its name and a rough business plan – in high school while working at a restaurant with an award-winning wine list. In college, he and his future wife, Kayla, began making wine in their apartment, and in 2010 – just two weeks after they were married – they founded Infinity Beverages. At the time, Matthew Rick was the youngest Winemaker and soon-to-be Distiller in the state at the young age of 23. 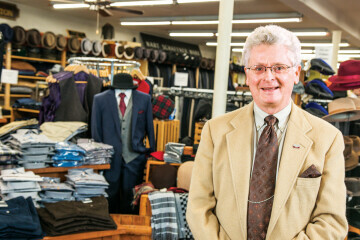 The business began in a 600-square-foot room in Eau Claire’s Banbury Place, a space so small that when the first containers of grape juice arrived for fermentation they wouldn’t fit through the doorway. Two years later, Infinity opened its original Tasting Lounge at Banbury Place, which soon caught on with wine and spirit drinkers looking for locally made libations. 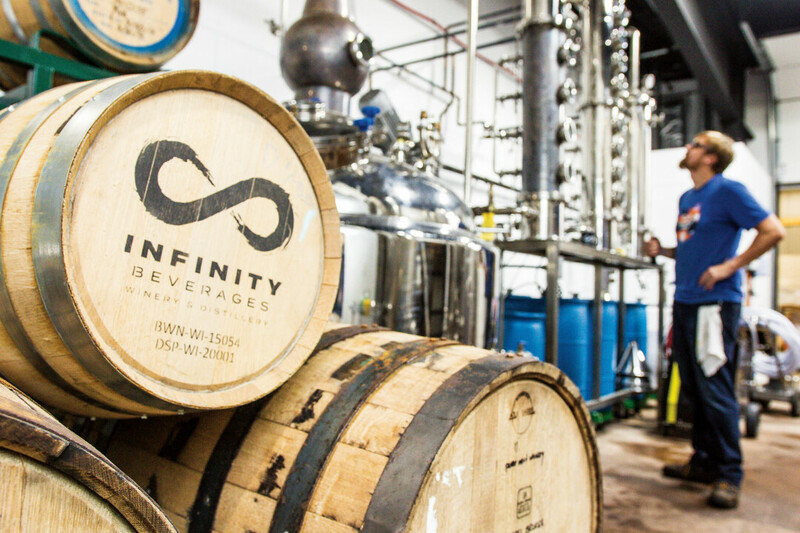 Innovation is really at our core at Infinity, and the Experimental wines and spirits allow me to continuously push the envelope. Back in 2016, moving forward meant finding a new home for Infinity. With standing-room-only crowds in its Lounge and fermentation tanks and pallets of bottles filling every available inch in the back, Rick was ready for his next step. That year, Infinity moved to its current home, 3460 Mall Drive, a space that allowed it to triple in size to about 7,500 square feet. 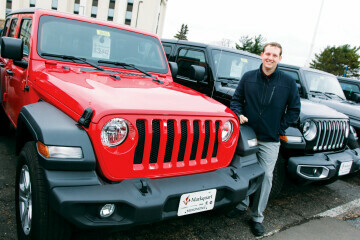 Practically overnight, the business grew from four to 20 employees, and soon production tripled as well. Today, patrons gather in the spacious Tasting Lounge to enjoy Infinity’s wines, spirits, and specialty cocktails in a cozy yet modern setting. Just to the right of the bar is a large glass door that provides a view of towering, 1,000-gallon fermentation tanks. (You can call in advance to book a tour). There is a mezzanine which seats 52 people and can be rented for private gatherings. 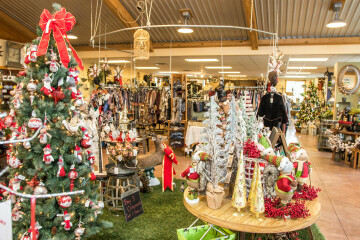 Infinity handcrafts a growing roster of 17 regularly available products. Signature grape and fruit wines range from the award-winning Solace, a dryer yet fruity wine that is a mix of Syrah and Pinot Noir, and best-selling wine Panache, a half-and-half combination of Pinot Noir and Zinfandel, to mulberry and apricot fruit wines. (Infinity is the only place in the United States where you’ll have an opportunity experience a 100 percent mulberry wine.) There are Port style dessert wines named after Rick’s daughter, Adalina; three varieties of vodka, including one infused with chile peppers and their best-selling vodka infused with vanilla and espresso beans; and two kinds of whiskey distilled from craft beer, aka Beerskey. 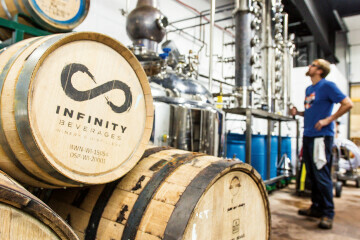 More recently, Infinity has begun to bottle its own specialty ready-to-drink cocktails (just add ice and enjoy), including Summer Heat, Summer Sangria, and Roasted Toasted Almond. Then there is an ever-expanding list of experimental wines and spirits: most currently, Mulled Wine and Whiskey Barrel Vanilla Espresso Infused Vodka. Some of these are only made once in small batches, while others – such as Syrah aged in charred whiskey barrels – have become repeat favorites. “Innovation is really at our core at Infinity, and the Experimental wines and spirits allow me to continuously push the envelope,” Rick says. “Above all, however, each of us at Infinity have a deep passion for sharing Infinity’s wines and spirits. 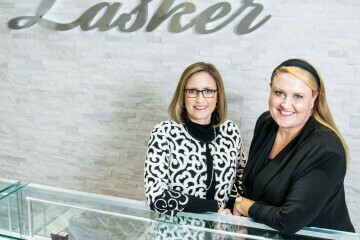 We hope to use that passion to help the Chippewa Valley create new memories each time they visit us.” It’s an inventive approach that wine and spirit lovers can taste in each glass.